జోష్ హచర్సన్ ( జననం: అక్టోబర్ 12, 1992 ) అమెరికాకు చెందిన నటుడు. ఇతను 2000 సంవత్సరం నుంచి తన నట జీవితాన్ని ఆరంభించాడు. 2002లో హౌస్ బ్లెన్ పైలట్ ఎపిసోడ్ లో నటించడం ఇతనికి మంచి గుర్తింపును తెచ్చింది..
↑ Fun Facts About Josh Hutcherson. The Ellen DeGeneres Show. (February 8, 2012). URL accessed on December 4, 2013. 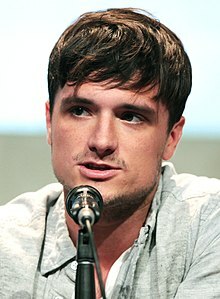 ↑ Josh Hutcherson Biography. FYI. URL accessed on December 4, 2013. ↑ 25th Annual Awards. Young Artist Association. URL accessed on November 27, 2013. ↑ 26th Annual Awards. Young Artist Association. URL accessed on November 28, 2013. ↑ 29th Annual Awards. Young Artist Association. URL accessed on November 27, 2013. ↑ 30th Annual Awards. Young Artist Association. URL accessed on January 6, 2014. ↑ Knegt, Peter (October 18, 2010). "Winter's Bone" Leads 2010 Gotham Award Nominations. URL accessed on January 9, 2014. ↑ 2010 WAFCA Awards – The Washington DC Area Film Critics Association (WAFCA). Washington D.C. Area Film Critics Association: (December 6, 2010). URL accessed on January 9, 2014. ↑ Morris, Wesley (December 13, 2010). 'Social Network' is tops with Boston Society of Film Critics. The Boston Globe. URL accessed on January 9, 2014. ↑ Carlson, Alex (January 10, 2011). Catching Up on Some Critics Awards. Film Misery. URL accessed on January 9, 2014. ↑ 16th Annual Critics' Choice Movie Awards (2011). Broadcast Film Critics Association: (November 20, 2011). URL accessed on January 9, 2014. ↑ The 17th Annual Screen Actors Guild Awards. Screen Actors Guild. URL accessed on January 9, 2014. ↑ Josh Hutcherson to Receive "CinemaCon® Breakthrough Performer of the Year Award". National Association of Theatre Owners: (March 27, 2012). URL accessed on October 20, 2014. ↑ Teen Choice Awards 2012: List of winners. CBS News: (July 23, 2012). URL accessed on January 9, 2014. ↑ Rome, Emily (August 20, 2012). Ben Affleck, Lea Michele, Will.i.am, other celebs honored at Do Something Awards. Entertainment Weekly. URL accessed on December 3, 2013. ↑ 'The Hunger Games' wins big at People's Choice Awards. Entertainment Weekly. (January 10, 2013). URL accessed on December 3, 2013. ↑ Nordyke, Kimberly (August 10, 2014). Teen Choice Awards: The Complete Winners List. The Hollywood Reporter. URL accessed on November 13, 2014. ↑ Longeretta, Emily (June 9, 2015). Teen Choice Awards Pit One Direction Against Zayn Malik. Hollywood Life. URL accessed on June 14, 2015. ఈ పేజీలో చివరి మార్పు 28 మార్చి 2018న 14:30కు జరిగింది.